University of Cape Town. Photo: Wikimedia Commons. 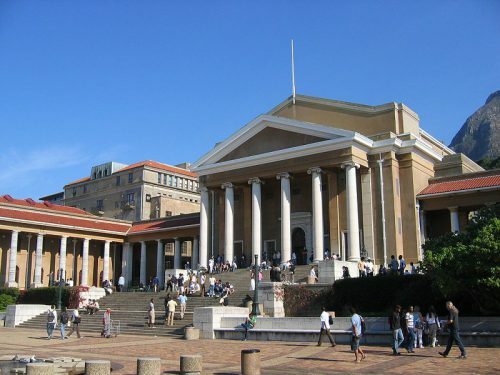 The University of Cape Town said on Tuesday it had moved up two places to reclaim its top 10 position in the 2019 QS World University Rankings by subject, placing among the top 100 universities in a total nine disciplines. The rankings assessed 1,222 institutions, ranking them across 48 disciplines in five broad subject areas. The university moved up two places from 2018 to ninth position for development studies. It is the only university in the global south to feature among the top 10 for this discipline. Eight other subjects at UCT were also ranked among the top 100, including anatomy and physiology, anthropology, archaeology, architecture/built environment, education, geography, social policy and administration, and sports-related subjects. UCT vice-chancellor Professor Mamokgethi Phakeng said: “We at UCT pride ourselves on the impact of our research in combating the numerous issues faced by our continent – and more broadly, the global south. In the five broad subject areas for 2019, UCT was ranked 145th for arts & humanities, 300th for engineering & technology, 112nd for life sciences & medicine and came in 223rd place for natural sciences and 166th for social sciences & management.